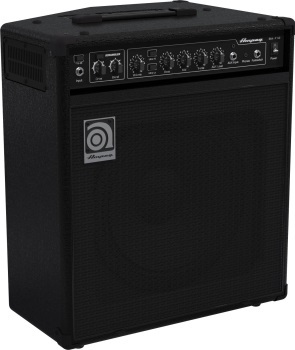 The Ampeg BA-112 12" Bass Combo delivers classic Ampeg tone and performance-driven features in a professional design perfect for rehearsal or practice. Featuring Ampeg's Bass Scrambler™ overdrive, the BA-112 delivers grit and grind any bassist will love. The BA-112 also features a true 60-degree sound reinforcement monitor angle that adds clarity in any situation. The front-facing panel is always accessible with great features like a headphone out /line in to practice silently with your mobile music device. The ruggedly portable design features an all-steel amp chassis and metal corners to protect your investment during transport and gigging.